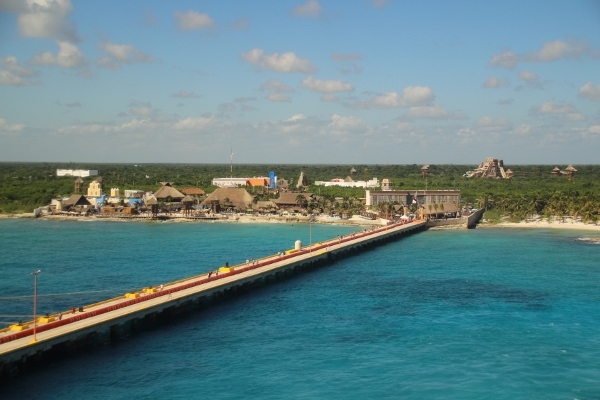 We were not docking in Costa Maya until the afternoon, so this morning felt essentially like a day at sea. 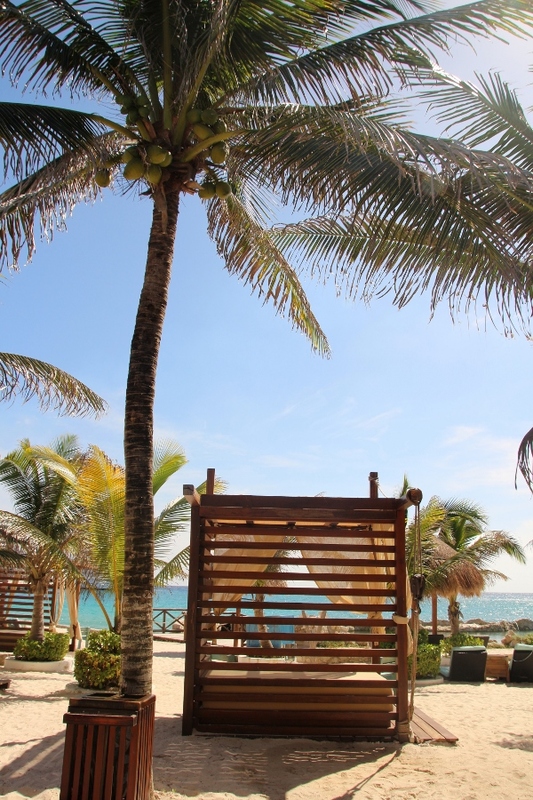 Breakfast was at Cabanas, just like every other morning. 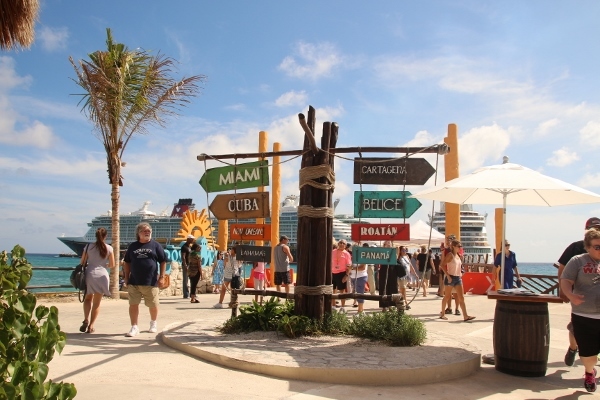 Both Cozumel and Costa Maya days featured my very favorite Cabanas breakfast menu item, the Mexican Hot Pocket! 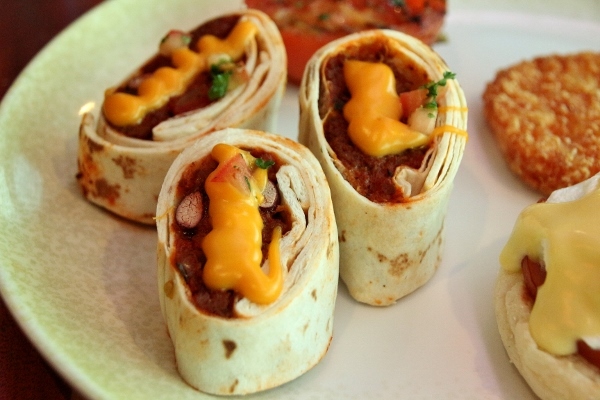 It's not really a hot pocket, but rather a tortilla roll stuffed with seasoned ground beef and beans, sliced and topped with a drizzle of cheese sauce. It's so good! 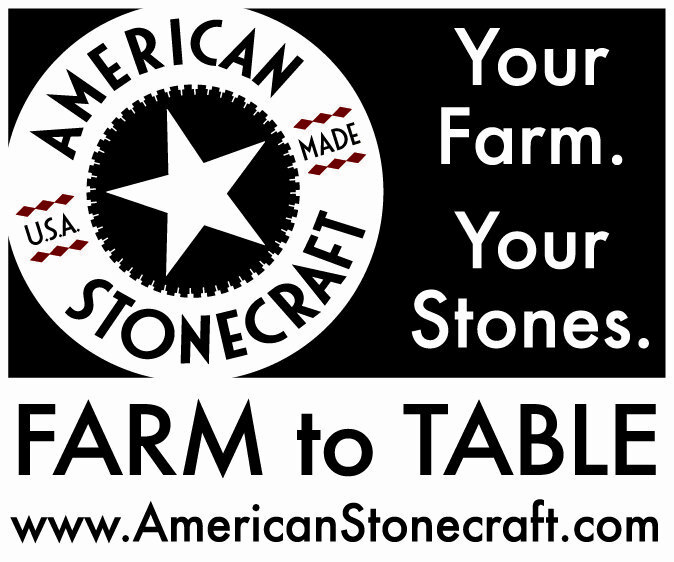 I managed to find the recipe online so I plan to scale it down and try making it myself soon. I hope it's as good as it is on the ship. Will keep you all posted, of course. After breakfast my mom and I hit up the Aquaduck as soon as it opened, and managed to ride it 5 times in a row before we could no longer climb the stairs to the top. That's the only downside when there is no line. You tire yourself out climbing the stairs all in one shot instead of waiting in a long line leading up. 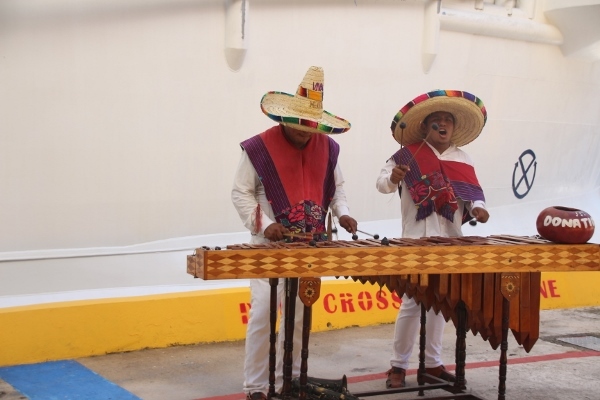 It's by far one of my favorite activities aboard the Disney Fantasy! After spending post-Aquaduck time in the Quiet Cove pool area, it was time for lunch. 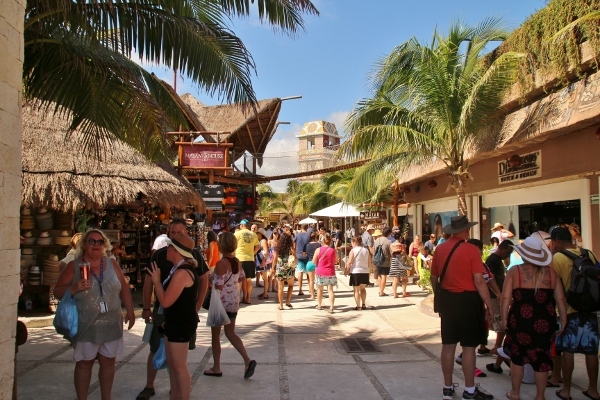 We headed back to Cabanas. 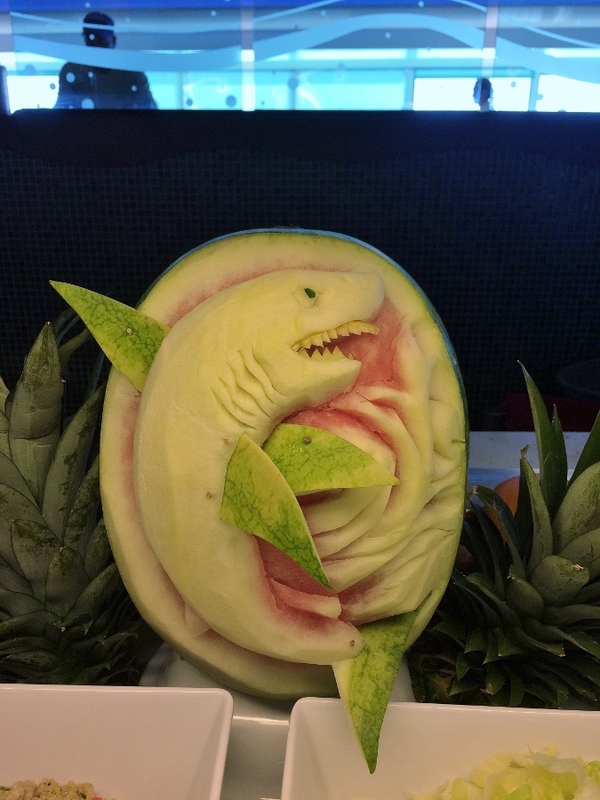 I loved this shark fruit carving near the salad station! I wish I had the talent to do this myself. 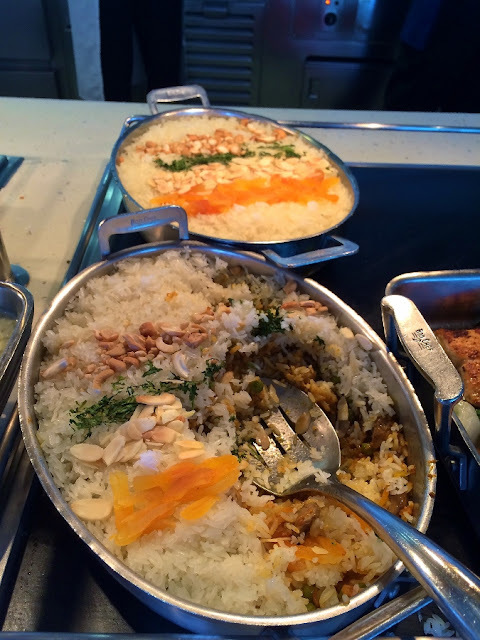 Lunch was good, and I was particularly impressed by the vegetable biryani which was as beautiful as it was delicious. 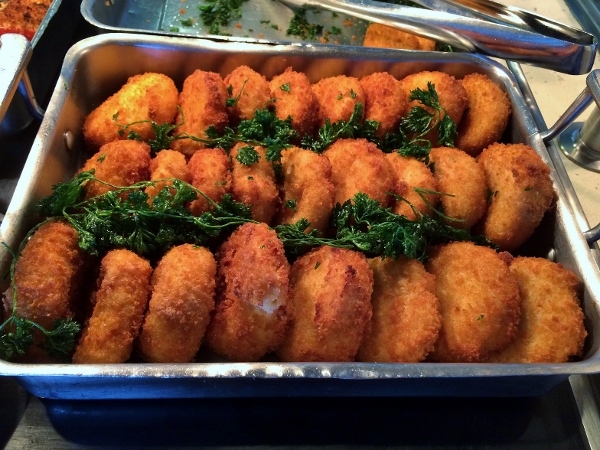 Another top contender are these smoked haddock cakes. Crispy on the outside, soft on the inside, and served with a choice of tomato chutney or tartar sauce. Both are excellent pairings. 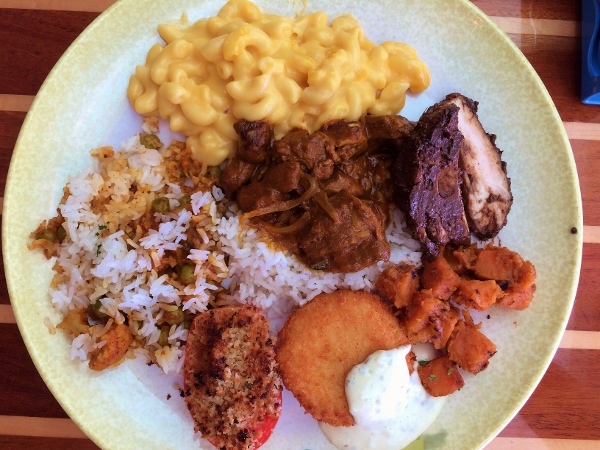 My lunch choices also included macaroni and cheese (I love it, even if it's meant for kids), lamb curry with rice, jerk chicken, sweet potato, and tomato provencal. 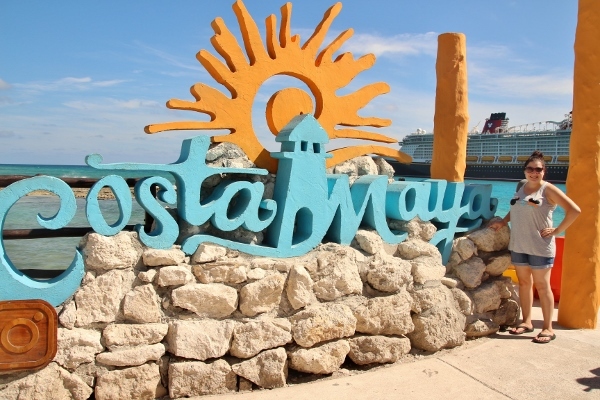 Just as we were enjoying our lunch, the ship was pulling into port in Costa Maya. 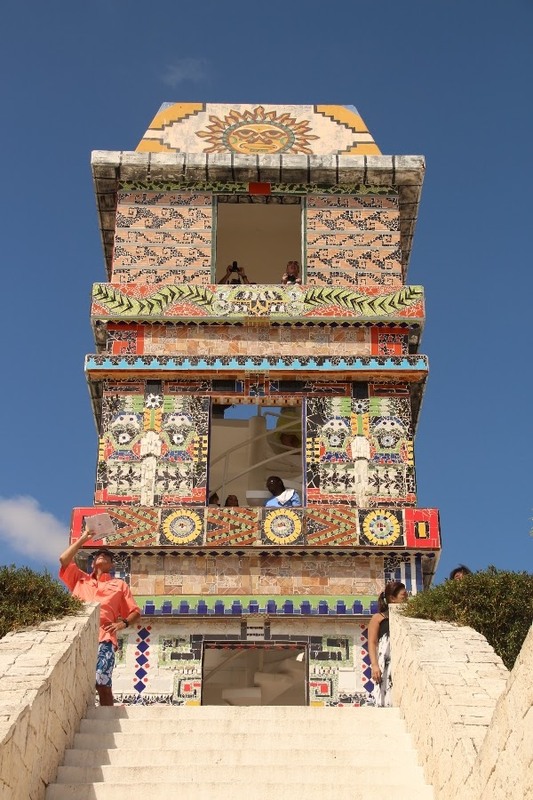 We had not planned any excursions this day, and decided to treat the whole day like an additional day at sea, just enjoying the ship. 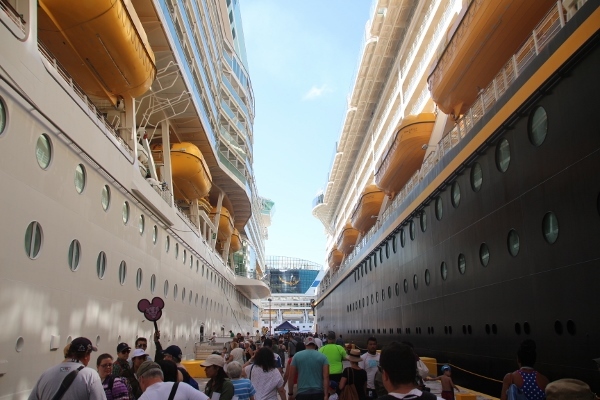 My parents and I decided to take a quick walk around the port to check it out though. 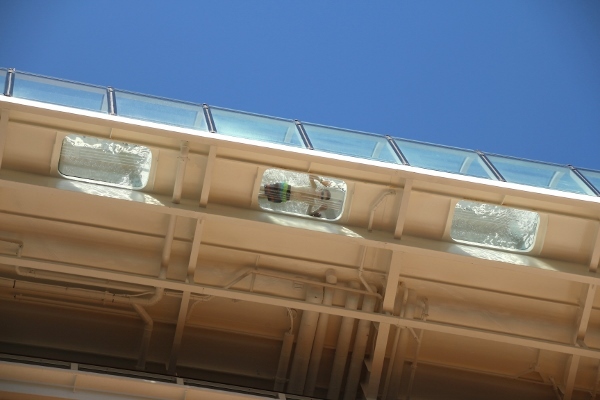 Hello, up there in the glass bottom splash pool! It was insanely hot, and I didn't spend too much time on dry land before yearning for the air conditioning of the ship. It's a good thing I had already planned on seeing a 2 pm screening of Coco with my older nephew Alex! It was AMAZING! Totally tear-filled, but seriously such a great movie, and a nice cool reprieve from the searing hot sun outside. 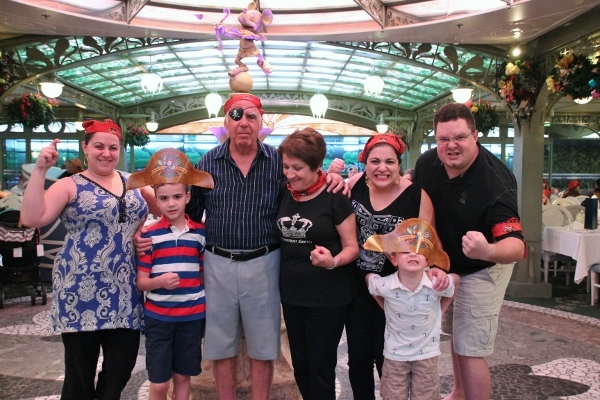 Tonight aboard the ship was pirate night, or Pirates IN the Caribbean. 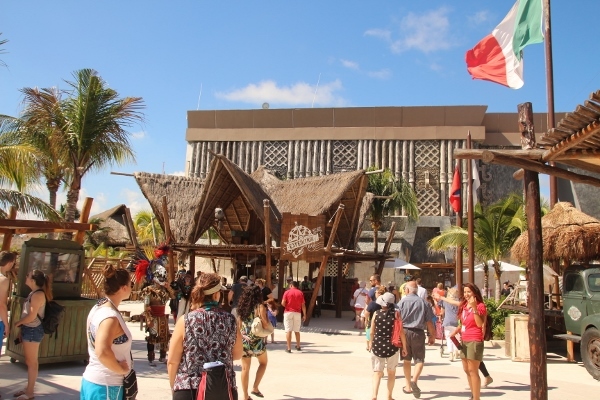 Guests are welcome to dress up in pirate-inspired outfits if they'd like, the menu at dinner is a special pirate menu, Disney characters dress up in pirates costumes as well, and there are pirate shows and even fireworks at the end of the night. 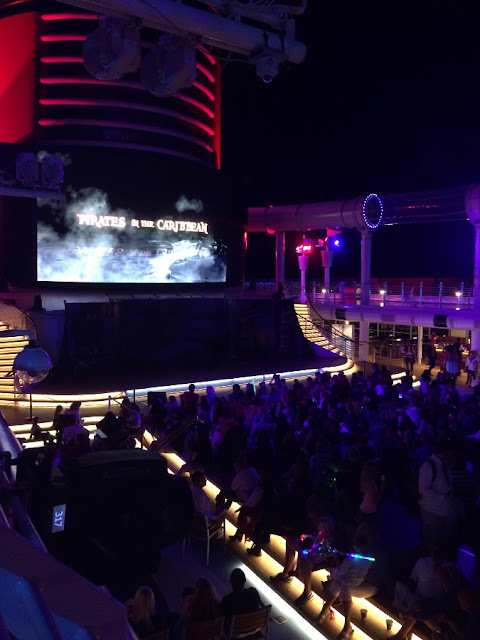 This is probably my favorite night on the ship, and so much fun even if you don't go all out by dressing up. The pirate menu was the same for many years, and although I personally enjoyed it I was really excited to see some changes since our last sailing. Quite a few items on the menu have changed in that time, and I was definitely excited to try them. 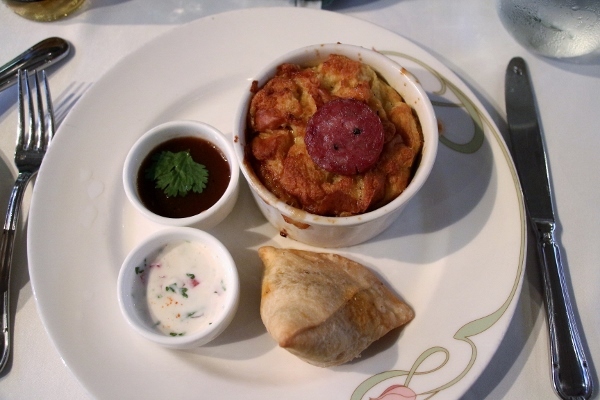 I decided to double up on my appetizers and try both Sri Sumbhajee's Vegetable Samosa filled with potato, peas, garlic, cumin, and ginger, and served with tamarind chutney and yogurt raita, as well as "Boucanier" Smoked Saucisson, Baked Brie, Brioche, and Honey with Sliced Figs and Caramelized Orange. The Samosa was definitely the better of the two. The "Boucanier" was reminiscent of a sweet/savory bread pudding. It was tasty, but a little too sweet to be an appetizer, even with the sliced sausage on top. 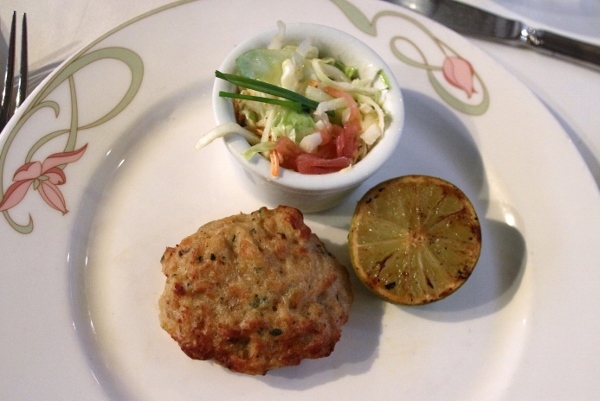 My mom got Davy Jones' Locker Rock Crab Cake, which appears to be similar to the crab cake on the previous menu but with an updated name and a different kind of slaw. 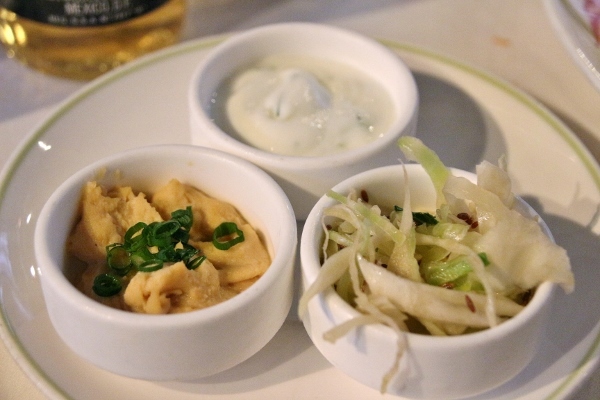 This is an appetizer I have enjoyed in the past, and is a better choice in my opinion than the "Boucanier." 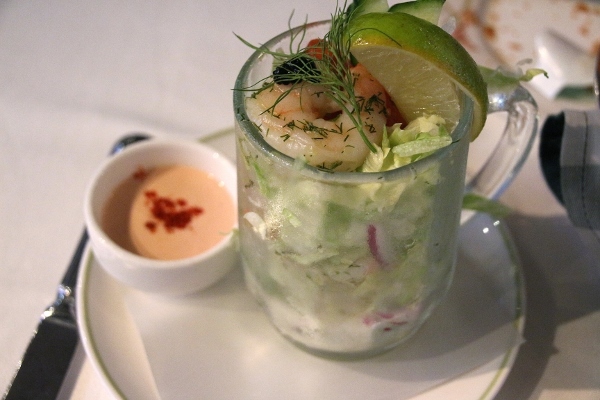 My brother-in-law tried Master Gibbs' "1/2 Pint of Shrimp" Cocktail, which appears to be the same dill-marinated shrimp as was on the previous day's appetizer sampler on iceberg lettuce with cucumber, tomato, caviar, and a Marie-Rose sauce. For her entree, my mom tried the Barbary Coast Falafel off the vegetarian menu. She absolutely hated it. It was more like a chickpea patty than falafel. 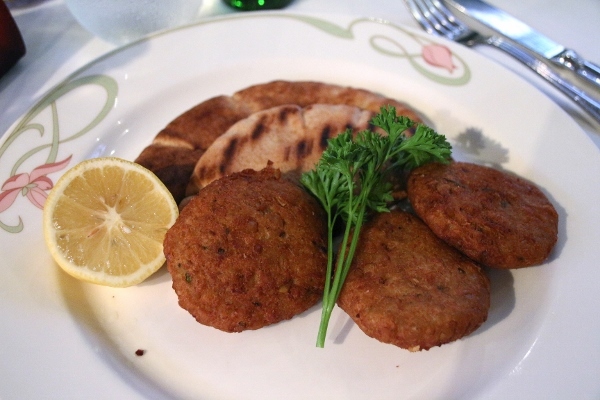 It was not crispy on the outside and did not have the typical texture and flavor of falafel. It's unfortunate that it was advertised this way because any falafel-lover would have been disappointed. 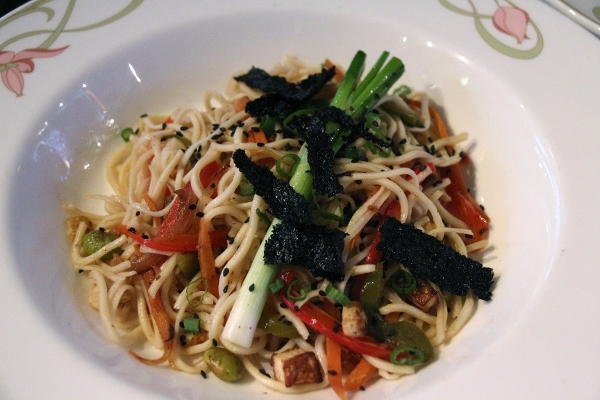 We also tried the Shanghaied Noodle Stir Fry, a blend of egg noodles with nori, edamame, white soy sauce, marinated tofu, scallions, peppers, carrots, and sesame seeds. Our head server claimed it was spicy but it actually wasn't spicy at all. My brother-in-law and I both ate some of it and really enjoyed it, but it definitely wasn't spicy. This would be the better choice of the two vegetarian entrees in my opinion. 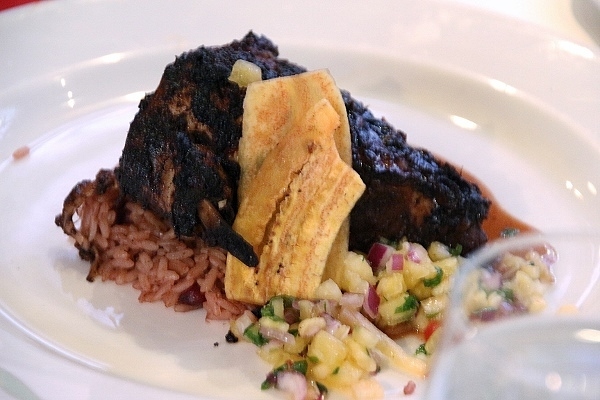 My sister is a jerk chicken fiend, so she jumped at Tia Dalma's Jerk Chicken, marinated for 48 hours, grilled, and served with rice and peas, fried plantains, and pineapple-chili salsa. She loved it, although it wasn't nearly as spicy as a traditional jerk (I wouldn't expect it to be on a family-friendly cruise). Dad got the same entree and didn't seem as impressed, but he's also less of a fan of eating chicken on the bone. 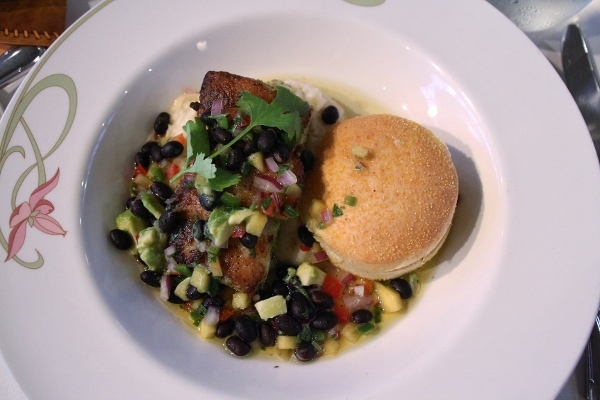 I selected Cortes's Cilantro Marinated Caribbean Grouper Filet, served with a crab-filled arepa, roasted yucca and a mango, lime, avocado, red onion, and black bean salsa. 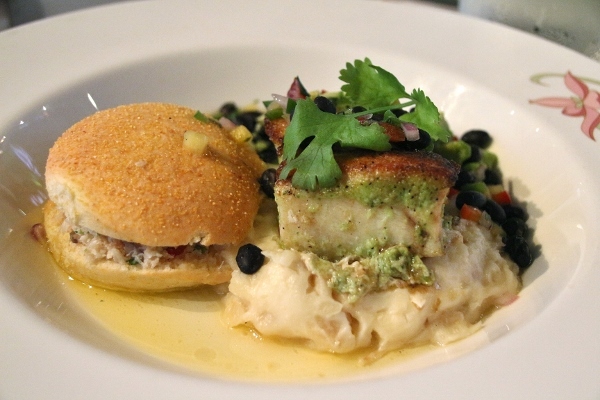 I was not only intrigued by the fish itself, but also the arepa, as it had been years since I'd eaten a good arepa and I certainly love crab. The fish itself was one of the best pieces of fish I ate on the cruise. It was incredibly tender and full of flavor. Perfectly seasoned and perfectly cooked. The salsa was a wonderful accompaniment and added a bit of acid to the fish. The crab-filled arepa is where I take pause. It was really not an authentic arepa, but seemed more like a flat, baked corn cake of some kind, sliced and filled with a minute amount of crab. Arepas are pan-fried and therefore have a very different texture (crispy on the outside) than something baked. From my experience eating this dish, it just didn't seem like a real arepa to me, much like the falafel was not real falafel. That was the only so-so aspect of this dish, however, because the fish was SO GOOD that it blew away everything else on the plate. 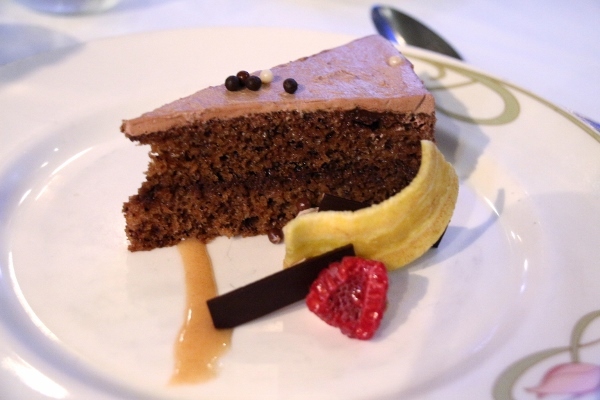 Historically on the cruise this week dessert has been one of the best courses of each meal. The same can be said today, as dessert didn't disappoint. A couple members of the family tried and enjoyed the Bananas in Paradise, which is layered banana bread with caramel fudge filling, served with banana spice puree. 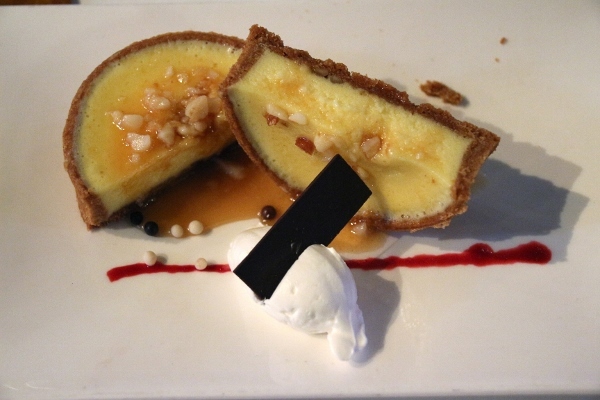 My dessert selection was the signature dessert, the Caramel Macadamia Nut Cheesecake Tart with whipped cream and caramel ganache. It was delicious, although a bit on the sweet side from the caramel. I was quite stuffed from my meal and didn't even get close to finishing it. After a short post-dinner break, the ladies in our party headed to the Skyline Lounge in Europa to imbibe on a craft cocktail before taking in the night's culmination, the Buccaneer Blast Fireworks. 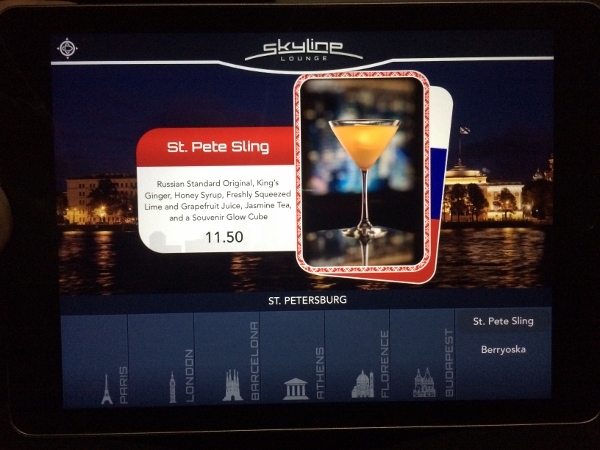 Skyline used to have a pretty cool light up menu but have switched over to an equally cool tablet menu. My drink of the night was the St. Pete Sling, a favorite from past cruises. Time for the highlight of the evening, and my favorite part of Pirate Night, the fireworks! I'll be honest, the Jack Sparrow show on the Disney Fantasy and Disney Dream is kind of lame in my opinion. I've seen in a few times, and I don't really care for it. 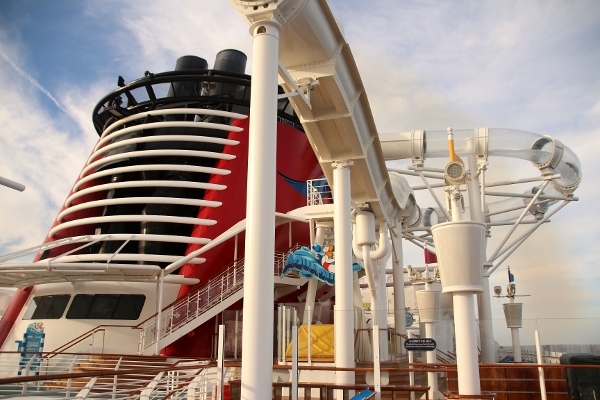 I completely prefer the show on the Disney Magic and Disney Wonder where Mickey flies across between the funnels and sets off the fireworks that way.